Soni Placement & Consultant Services, located in Surat, has its registered office in Udaipur (Rajasthan India). We have been serving our clients since 2009. We are listed amidst the most celebrated and genuine jewelry recruiters and jewelry consultants that are providing excellent solutions for obtaining jobs in various fields including jewelry job, diamond job, gems and jewelry jobs, gems & jewelry placements, luxury jobs, and others. We cater to varied demands of the clients and industries that include jewellery industry, diamond industry, retail, and E-commerce industries. Under the leadership of Mr. Mahendra Soni (Owner), the company has flourished rapidly and is still rising at a rapid pace. Share your CV with us and we will get back to you soon! 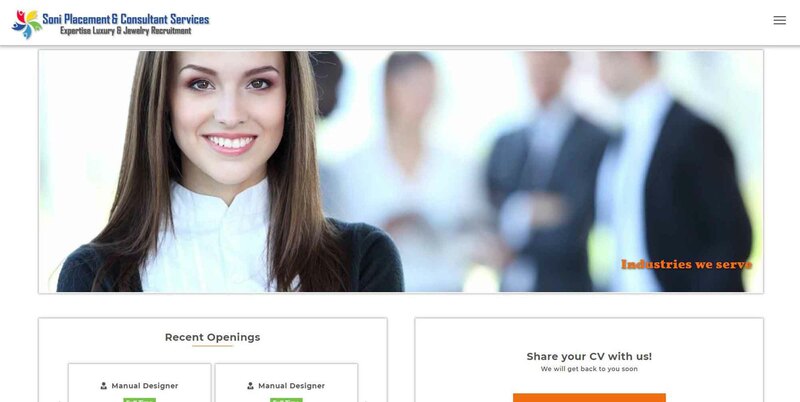 Apply for thousands of jobs acroos india. Your Confidentiality is our Priority. As a luxury and Jewellery Consultant, We understand the confidentiality of your Name, Number, Resume and Design Portfolio. We are not compromising with your privacy. Your data is always safe with us. Contact us to send your requirements. Soni Placement & Consultancy Services, located in Surat, has its registered office in Udaipur (Rajasthan). Soni Placement is a name that is reckoned for bringing forth qualitative and highly reliable jewelry placement solutions.